Last March, The History Channel ran a ten-hour mini-series called “The Bible”, which was viewed by millions of viewers making it a record-breaking hit for cable television. 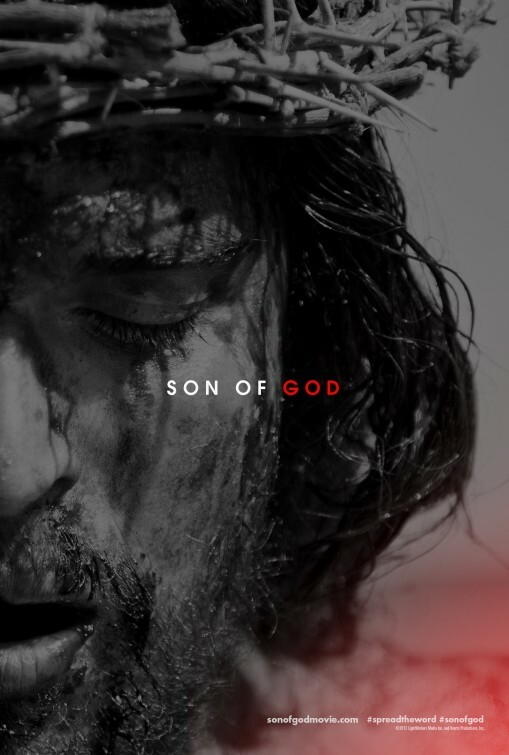 This year, Lightworkers Media, the Christian production company responsible for that epic series, has teamed with 20th Century Fox to deliver “Son of God” to those viewers, with the goal of recapturing those numbers theatrically. If you don’t believe me, just look at the poster. Down there on the bottom where it broadcasts group ticket sales, appealing to all congregations, be they mega or small. That’s not really a new marketing tactic, since Christian-minded movies often earn a flock of like-minded viewers and have for some time. Still, the obvious agenda could be less overt and use some subtlety by simply allowing the movie to stand on its own. But then again, the entire movie, like the mini-series it is culled from, is anything but subtle. Unless something completely different is presented in “Son of God”, like what Scorsese did with “The Last Temptation of Christ”, it almost seems redundant to go over the story presented here. 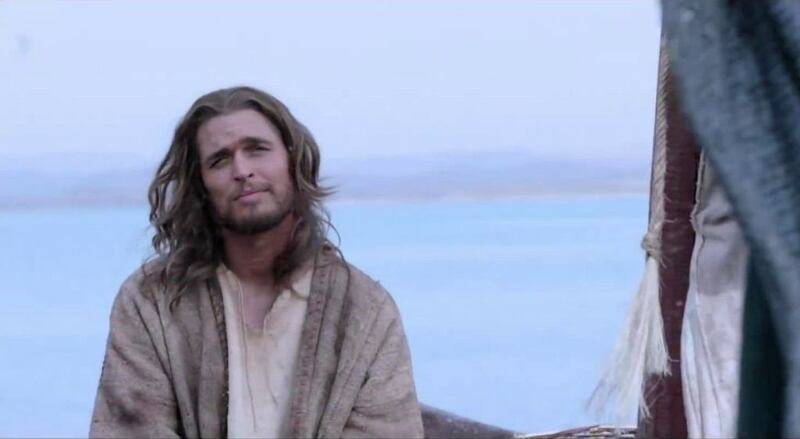 All the expected Gospel beats are hit (healing of the paralytic, fishes and loaves, walking on water and the like) with little time for character nuances, unique perspectives or even a feel for the daily lives of those around Jesus (Diogo Morgado). Like the series, there’s a rush to get through the material, offering what feels like a live-action abbreviated Cliff Notes version of the life of Christ. The movie opens with a short montage of Old Testament events. We see a quick glimpse of a beautiful Eve (of course) and a little bit of Noah’s ark, Abraham and Joshua and then it’s on to Bethlehem where shepherds and wise men follow a star to a certain manger, while opening credits populate the screen. Those scenes are basically an advertisement for “The Bible” series, to catch the audience up with what was previously offered and what they might’ve missed. In fact, this entire movie is compiled of scenes of Jesus’ life that were already in the series spliced with scenes that were left out. The final hour of the movie covers the betrayal and arrest of Jesus as well as the death and resurrection. It’s not as brutal as Mel Gibson’s “The Passion of the Christ” but it certainly lands on the far edge of its PG-13 rating. A believing moviegoer may be looking forward to taking the whole family, but it would be wise to consider what you think your child can handle. 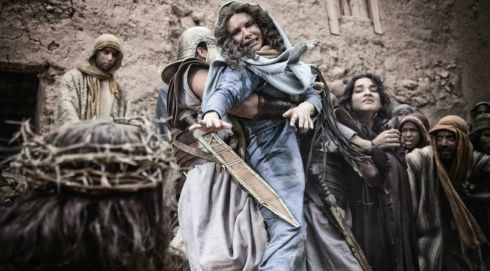 Remember, “Son of God” is not only blatantly appealing to the choir it is preaching to, it’s also aiming for fans of the sword and sandal genre. Although about 90% of the movie covers ground we’ve seen in countless Jesus movies over the past several decades, there are a few standout characters and angles that may make this worthwhile. The movie is bookending by an exiled John (Sebastian Knapp), who is serving as something of a narrator, providing his account of Jesus based on his time with him. It’s a different enough storytelling approach, but it made me want to know more about John. The uneasy working relationship between the elders of the temple and the Romans ruling over Jerusalem to be quite interesting. Even though the actors portraying these roles were mostly pretty bad (as most of the performances are throughout the movie), seeing the ambivalent Pontius Pilot (a weasely Greg Hicks) put the threatened Caiaphas (Adrian Schiller) in his place, as a hesitant Nicodemus (Simon Kurz) looks on, presented a different-yet-familiar aspect to the movie. Seeing the pressure build under both the elders and the Roman Prefect was an impact of Jesus that is seldom examined on film. While this was mostly there to serve the plot and move the story along, it was still interesting to see. Watching the Pharisees wrestle with the predicament of what to do with this miracle-performing blasphemer who has developed Messiah-seeking followers was much more intriguing than watching Morgado portray Jesus. The Portuguese actor (and former model) spends the first half of the movie walking around in a bad wig with a suspicious grim, looking like a half-baked, dirty Brad Pitt. 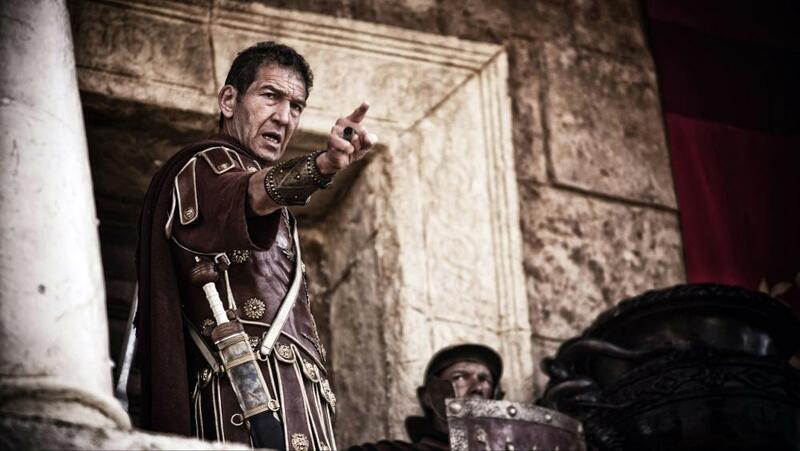 Delivering choice lines from the Bible with nary a trace of conviction or passion, the actor could’ve benefited from being more human or charismatic. I found it hard to comprehend why his twelve disciples would leave their lives and follow him. Granted, portraying Christ is no easy task and the material here is quite formulaic, but Morgado barely conveys an inspirational and loving figure. At least he’s not blue-eyed. Giving a stronger identity to the disciples could have fleshed out their motivation to walk with Jesus. Instead, we see thin characterization limited to what those well-versed in the Scriptures (or even Sunday school lessons from your childhood) already know. All of them, Simon Peter (Darwin Shaw) the loyal hothead, former tax-collector, Matthew (Said Bey), doubting Thomas (Matthew Gravelle) and Judas (Joe Wreddon), play all the expected notes, but there’s never a feeling of who these mean are and why they became followers. Hanging out with the guys is Mary (Amber Rose Revah), who is presumedly Mary Magdalene, even though she’s never referred to as such in the movie. Like the men, who she is isn’t touched upon, so we’re just left wondering. 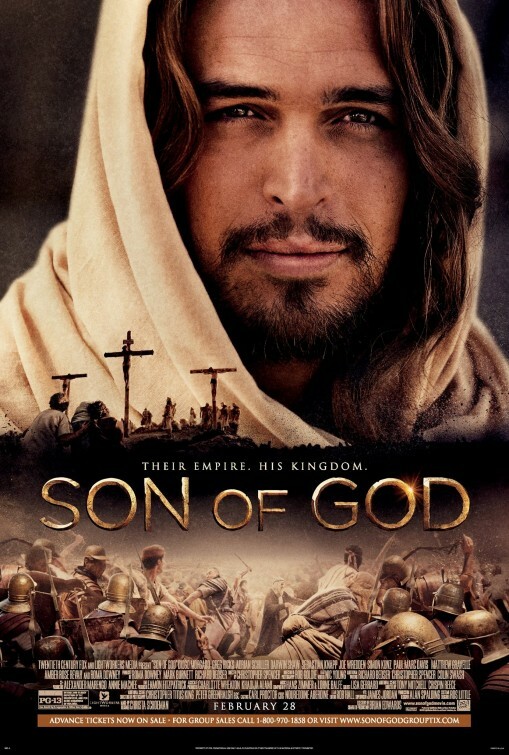 Speaking of wondering, those already interested in “Son of God” solely because it’s a Christian movie, might be concerned with the movie’s accuracy. They may be going in expecting some inaccuracies and could be curious what areas the movie removes itself from the source material. As far as I can tell, the glaring omission is the absence of baptism. It’s not mentioned at all. Water isn’t included when Jesus is explaining to Nicodemus how a man can be reborn and baptism is excluded in The Great Commission speech. Regardless of your stance on baptism, you can see how altering these crucial interactions is intentional and definitely noticeable for an audience in the know. I have no idea what doctrine co-producers and married couple Roma Downey (who plays the other Mary) and Mark Burnett or director Christopher Spencer follow, but it does seem odd to purposefully leave out something that continuously mentioned in the New Testament. On a technical level, the movie is a disaster when it comes to all the blurry established shots of the temple or of Jerusalem. I’ve seen better detail in video games like Prince of Persia and Assassin’s Creed. As a director, Spencer doesn’t offer anything uniquely distinctive, relying on excessive slo-mo shots for overly dramatic effect and parking the camera on nudge-nudge scenes like Pilot washing his hands. Again with the obvious. Nevertheless, this movie will fill theaters. It won’t matter how accurate it is or how it deviates from the Bible. For many, it will just be nice to see something that they’ll believe to be safe for them to see. Well, as a believer, I can say that the movie felt repetitive and empty, going through the motions of a story that’s been brought to the big screen over and over again. I would’ve welcomed a movie that was willing to offer a depiction of Jesus that would help viewers better understand who he was and what it was like to be with him. Unfortunately, that’s a missed opportunity here. This is the rare case in which I’ve read the book that a movie is based on and I can firmly assure you – the book is better.